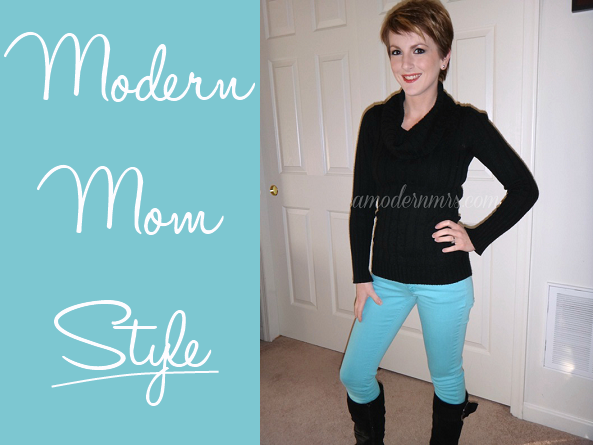 Modern Mom Style: Adding Some Color — a Modern Mrs. I'm a mom. I'm also still in my twenties, and want to feel good about myself. With that said, I look for clothing that's practical, but still stylish, and budget-friendly. Mom style used to be ill-fitting clothing and the ever-tragic "mom jeans." Now, mom style has mostly evolved to yoga pants and a t-shirt. Ladies, if it's a weekday and you aren't going to or coming back from the gym, you shouldn't be in yoga pants! You can look nice with minimal effort, and you will feel better about yourself! Today I'm wearing some pastel blue Mossimo skinnies (no longer available) with a black cowl neck cable sweater, and black Merona Macha Buckle Boots. Please forgive the shadow and general awkwardness of this photo... I just can not get a good outfit photo inside my house. Here's a better view of the boots. They have a zipper on the inside and offer a slouchy appearance. They're crazy comfortable! My only accessories are my wedding ring and my earrings, which are my daily norm. I haven't worn necklaces since getting my pixie back in March, and I switched to only wearing studs around that time as well. Today I'm wearing my basic round silver studs and the square silver studs from mark. 's Triple Threat Earring Set (discontinued). For makeup, I used MAC's "Cork" as a transitional color, then placed mark. 's "Tabac" Wet/Dry Eye Shadow into the outer corner, and took what was left on the brush into the crease. I then placed Wet n Wild's "Brulee" on my lid, and "Sugar" on my brow bone and inner corner. I blended all colors with a tapered blending brush, then went back into my outer corner and the outer third of my lid with "Tabac" and a pencil brush to create depth. I used mark. 's No Place to Run Eyeliner in "Jet Set" on my lash line and smoked it out with the same pencil brush I used earlier. 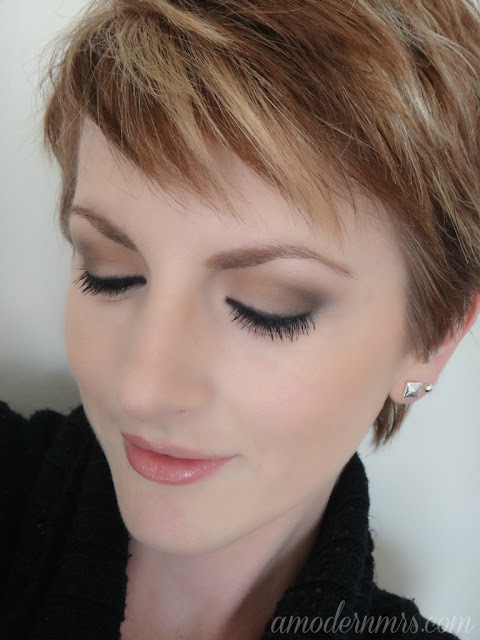 I lined my waterline with "Jet Set" and applied black mascara to my top and bottom lashes. For lips I used L.A. Colors' Lip Liner in "Natural" and topped it with a little Vaseline Lip Therapy, but a clear gloss would work just as well! How do you play with color in your outfits? Fabulous! You're so tiny! I'm a little iffy on those pink skinnies I bought yesterday. You're tiny, too! Why? What are your thoughts on them now? From what I could tell in the pictures you sent, they're neither too snug or too short. I don't know your style, but a collared shirt would look nice, paired under a sweater or by itself, any kind of neutral-toned blouse, a striped top would look a-ma-zing, and a tunic would most definitely work! Since they're so fitted, a looser-fit top would be a good match. I LOVE your pants! I have a sweater that's similar, but I'm scared of skinny jeans. Thanks, @0cf13dbb6b95231ea143b95a3c924b0e:disqus ! Don't be scurred. It's all about finding the right fit. Experiment with a few different brands till you find one that fits you in all the right ways!